We’re pleased to announce the recent launch of sponsored ads (formerly Amazon Marketing Services, or AMS), our search advertising solution for vendors on Amazon, in the Canada marketplace. 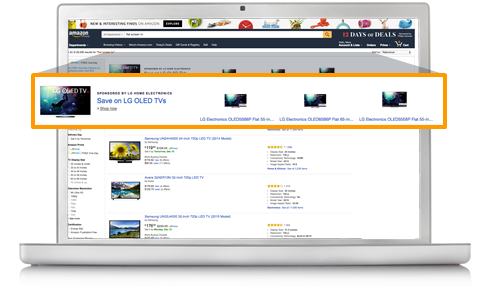 Search is an important tool used by Amazon shoppers to discover brands and products they might want to buy. 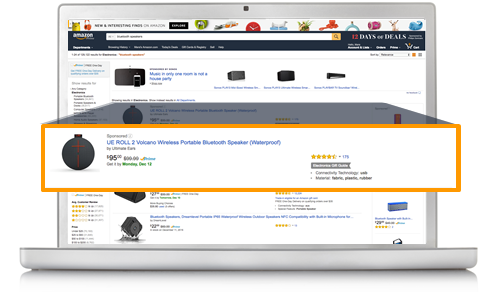 In fact, 76% of Amazon shoppers use the search bar to find an item,1 and search advertising is a way for brands to stand out among the competition—driving consideration at a crucial moment within the customer decision journey. Sponsored ads provide simple and effective solutions that allow brands to reach receptive audiences with relevant search advertising during moments where customers are actively searching and browsing products to buy—with proven success. In 2016, on average, sponsored ads advertisers in the US saw more than 7x return on ad spend (ROAS). Sponsored Products allow brands to organically promote individual listings on top of and within search results. These ads are targeted using keywords to match customer search terms, helping drive awareness as shoppers are considering options to purchase. Sponsored Brands (formerly Headline Search Ads) help drive brand awareness with keyword-targeted ads that feature three products and a brand logo within a prominent placement at the top of search results. These ads can drive shoppers to a Store, a custom multi-page shopping experience that showcases your brand and a curated selection of your products. Read more about Sponsored Brands here. Product Display Ads (PDA) allow brands to advertise listings using surrounding media on product detail pages, reaching shoppers when they are closer to the point of conversion—adding an item to their shopping cart. These ads are targeted to individual products, product categories, or shopper interests. You can get started in just a few minutes by logging into your advertising console account and using our step-by-step ad builder. Sponsored Products ads are eligible to go live once you create them. For Sponsored Brands and Product Display Ads, ad creatives undergo moderation, and you’ll be notified whether they are approved within 72 hours. Once your ads are up and running, you can track results with detailed campaign reports. Make sure to review them at least once a week so you can see what’s working and make adjustments to your campaigns as necessary. Also make sure to run your ads with no campaign end date. An always-on advertising strategy means you can keep your products top of mind for shoppers at all times and never miss a sales opportunity. When you monitor the results of your continually running campaigns, you’ll also be able to see how performance changes over time and track seasonal trends. All sponsored ads are pay-per-click, meaning you only pay when a person clicks on your ad. We support payment by all major credit cards. Per click: Choose how much to bid on an ad click. You’re never charged more than that amount per click. Per day: Your spend per day will not exceed the daily budget you select. Once this amount is reached, ads will stop running for that day. Per campaign (Sponsored Brands and PDA only): Headline Search Ads and Product Display Ads also provide the option of setting budgets at a campaign level. Once this amount is reached, ads will stop running. 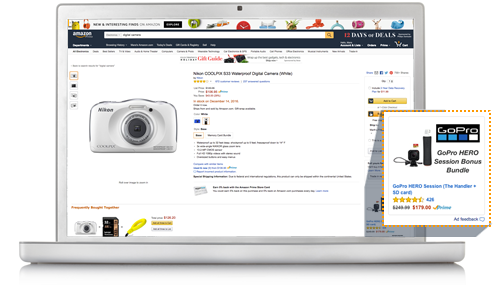 Ready to get the most out of selling on Amazon.ca? Register to get started.